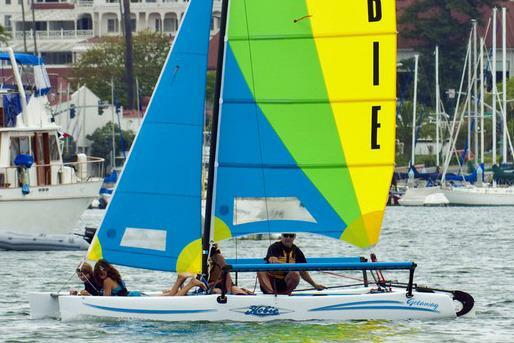 Take the party on the water with the Hobie Getaway. 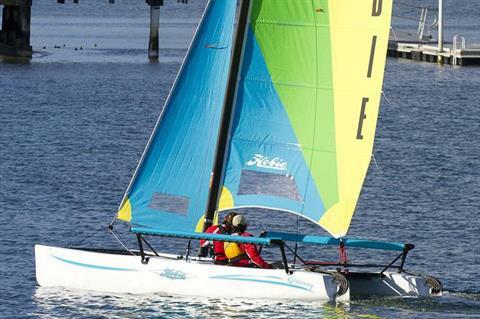 When the agenda involves sailing with friends and family, the Hobie Getaway is a sure-fire ticket to multihull fun. Stir in the boat’s performance-minded symmetrically shaped hulls, its efficient, mainsail-driven sailplan and its roller-furling jib and you quickly discover a sailing pedigree that leaves “party boats” stalled out. With the Getaway, there’s no worry about impromptu raft-ups, beaching or docking; its impact-resistant, rotomolded polyethylene hull provides years’ worth of family fun. But most impressive is the Getaway’s awesome value—expect great times for a modest price tag.